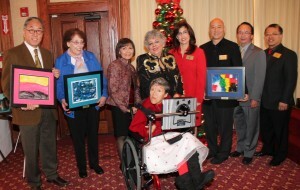 John and Mary Duce, The Beth & Wilbur Woo Family Foundation and the Monterey Park City Council were honored by MERCI for their generous donations on December 8 at Luminarias Restaurant. 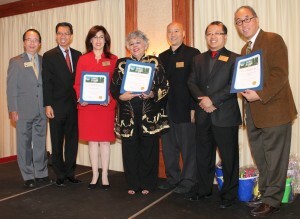 Mary Duce was unable to attend so Mary Louise Uranga accepted the honor for her, Mike Woo accepted the honor for his family and Councilmembers Teresa Real Sebastian, Mitch Ing, Hans Liang and Peter Chan accepted the honor on behalf of the city. Mayor Real Sebastian thanked the MERCI board, parents and Marta Escanuelas for MERCI’s commitment to the city. Five votes from the Council approved the $45,000 donation to the project. Mike Woo thanked MERCI on behalf of his family. They are grateful for the programs at MERCI. His 90-year-old mother, Beth Woo, is grateful for the assistance that MERCI has provided for them. Mary Louise Uranga thanked the board on Mary Duce’s behalf for this honor. Deborah Gallardo created each beautiful picture for this celebration. My name is Deborah Gallardo; I was born on April 17, 1952. I was born with Cerebral Palsy, which prevents me from walking by myself someone has to hold me from my waist and then I move my legs in a walking motion. I cannot use my hands and I have a speech impediment. I have my A.A. and B.A in Liberal Studies. I’m bilingual in English and Spanish. I use my communication device to talk with people. I use a hat or a head pointer that consists of four strips. Two strips are of plastic, one strip goes around my head the other strip goes across my head. The strips made of thick cloth go underneath my chin with a piece of Velcro to keep my head pointer in place. In the middle of the head pointer there is a metal rod with a hard plastic tip. I use this head pointer to type on my communication device, computer and electric typewriter. I love to paint. I use a head pointer to paint. The head pointer is made the same with the only exception on the end of the rod there is a small cylinder with a small hole to insert a painting brush, colored pencil or marker. I use different colors in my paintings to reflect how I feel. I love to experiment with color. Thanks to Dr. Ida my Primary doctor and Rancho Los Amigos Hospital for caring for me. Rancho Los Amigos fixes my communication device and my adaptive equipment. Dr. Wang keeps me in very good health, so my caregivers don’t have to worry about my health. Thanks to my grandfather Mr. Alberto Delfin, Grandmother Mrs. Eustacia Delfin and my mother Mrs. Carmen Gallardo for their love, care and patience they gave me. They taught me the difference between right and wrong. Lastly, I would like to thank MERCI for giving me the opportunity to help others and for supporting my Self Advocacy group. 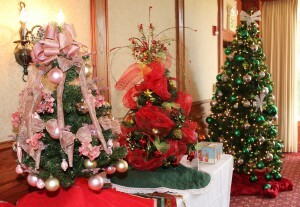 400 guests enjoyed a delicious brunch as they met long time friends and made new ones at this beautiful Christmas party. 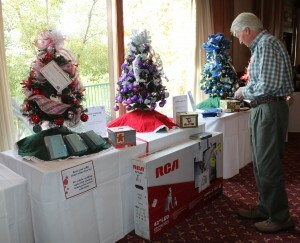 Some of the twenty-two beautifully decorated trees with gifts each with a different theme were available for guests to win by putting their raffle tickets into the box in front of each tree. 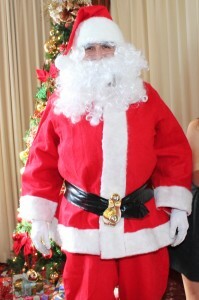 Santa Claus welcomed everyone to this party. He listened to children of all ages as they stated their Christmas wishes. Mike Eng was the Master of Ceremonies. He welcomed the guests to this very special fund raising event. He asked them to be generous and have fun. 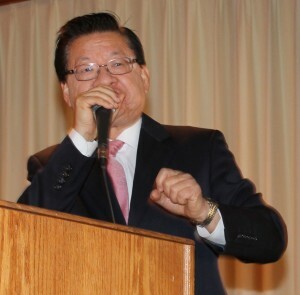 He also introduced some of the special guests that included Congressmember Judy Chu, Assemblymember Ed Chau, Mayor Teresa Real Sebastian, Councilmembers Hans Liang, Peter Chan, Mitch Ing, City Clerk Vince Chang, Alhambra School Boardmember Adele Andrade-Stadler, Garvey School Boardmember Bob Bruesch and Water Boardmember Thomas Wong. 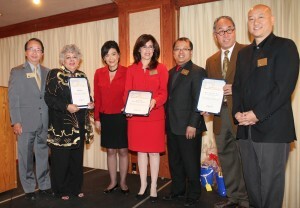 Congressmember Judy Chu welcomed all to MERCI’s event. She has been a MERCI supporter for 25 years. The parents stepped in to help their children with this school and Ernie’s Place. She works for MERCI and all of the residents. She presented proclamations to Marta Escanuelas, Mike Woo and the City Council for their support. Assemblymember Ed Chau said it is his honor to serve all of you in Sacramento. We have a positive financial outlook next year. This is his favorite holiday season to give thanks for what we have and help those who need our help. We are here to complete the construction project for MERCI and he will help all he can. He presented proclamations to Marta Escanuelas, Mike Woo and the City Council for their support. Liz Diaz, President of the Board, welcomes all to MERCI’s annual event. She thanked the guests for their support. Please continue to support MERCI. The staff and board worked hard on this event. MERCI has been in existence for 58 years. She thanked Mary Duce, the Woo family and the City Council for helping with the new construction. $300,000 is the balance of funds they need to raise to complete the construction project. Community College Boardmember Mike Eng thanked all of the donors to MERCI. 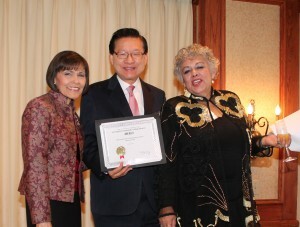 He presented a proclamation to Marta Escanuelas and Liz Diaz. He called them unsung heroes. Marta Escanuelas addressed the audience. It has been a tight year. We had to stop the construction for lack of funding. Please tell your friends that that MERCI will accept any donations, as any amount will help. 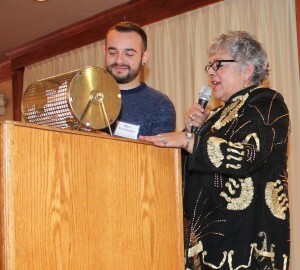 Marta Escanuelas and Marc Escanuelas announced the winners of the door prizes. Excited guests claimed the prizes. 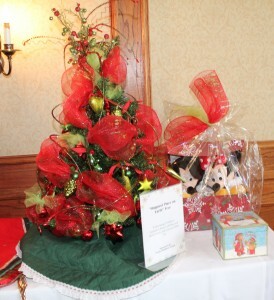 Several lucky tables had more than one door prize winner in their group. 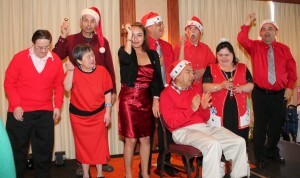 MERCI singers entertained the guests with Christmas carols to the delight of all. 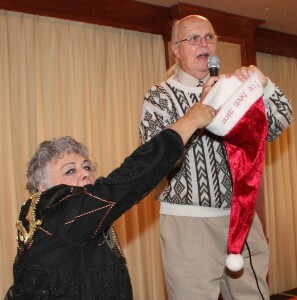 Bob Bruesch held up a Santa hat and asked for donations from the guests. Please give a $20 for MERCI. A $50 is nifty. The guests lined up to put cash and checks into hat. An additional $3,000 was raised for the construction fund. 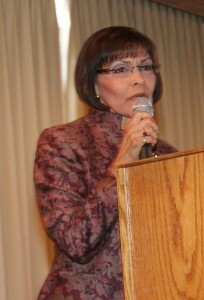 Marta Escanuelas thanked Bob Bruesch and the guests for their donations. She thanked the staff and volunteers for making this event happen. She thanked all of the supporters of MERCI. The construction stopped in April. She thanked the contractors EDGE/Ledcor and Facilities Builders & Erectors for their support. They are helping to complete the project. With their support it will happen soon. The moment had finally arrived as children pulled the lucky raffle tickets out of gift bags for the twenty-two trees. 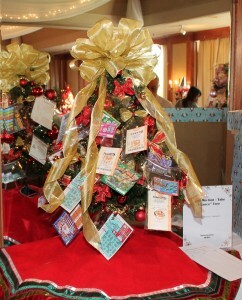 Marta Escanuelas announced the winning numbers as twenty- two lucky guests claimed their trees with gifts. Marta Escanuelas thanked everyone for their support. You make MERCI what it is today. It was a wonderful beginning of the Christmas Season. MERCI, Inc. is a 501(c) 3 non-profit origination, federal tax ID #95-2219917. Donations are tax deductible minus the amount of goods and services received. MERCI is located at 525 N. Chandler in Monterey Park, CA 91754. Their website is www.merci.org. Their phone number is 626-289-8817.